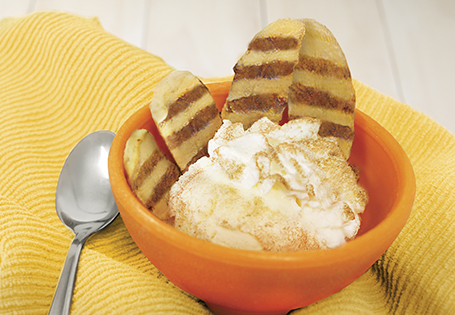 A light, flavorful version of an ice cream classic! Preheat grill or grill pan over medium heat. Halve the unpeeled bananas lengthwise so they will lay flat on the grill. In a small bowl, combine ½ teaspoon cinnamon and 1 tablespoon sugar. Sprinkle the cut side of the bananas with the mixture. Grill the bananas for 2 minutes per side. Allow to cool for 3 minutes. Peel away the skin and place 2 halves in a bowl. Add ¼ cup of ice cream. Top with a dollop of whipped dairy topping. Combine ¼ teaspoon cinnamon and 2 teaspoons sugar. Sprinkle over tops of splits before serving.